"PY GOLLY!! 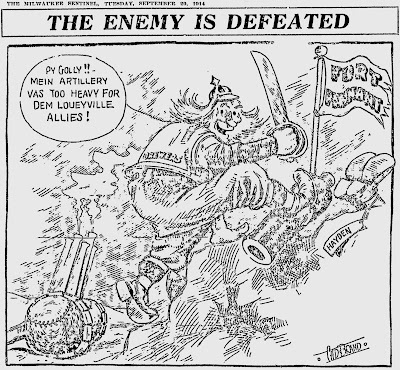 MEIN ARTILLERY VAS TOO HEAVY FOR DEM LOUEYVILLE ALLIES!" 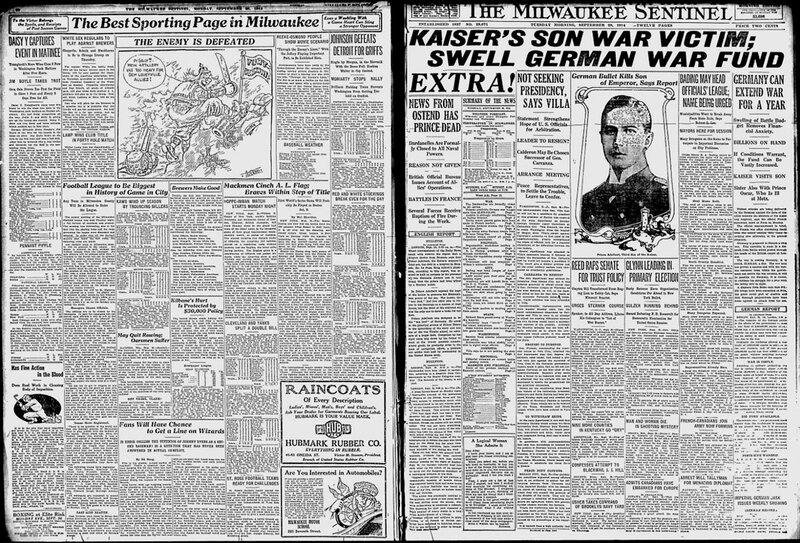 Two days before, the Brewers had defeated the St. Paul Saints 11-3 (relying on their "heavy artillery") to clinch their second consecutive American Association pennant over the second-place Louisville Colonels. That's their manager "Scrappy Jack" Hayden playing the corpse above. 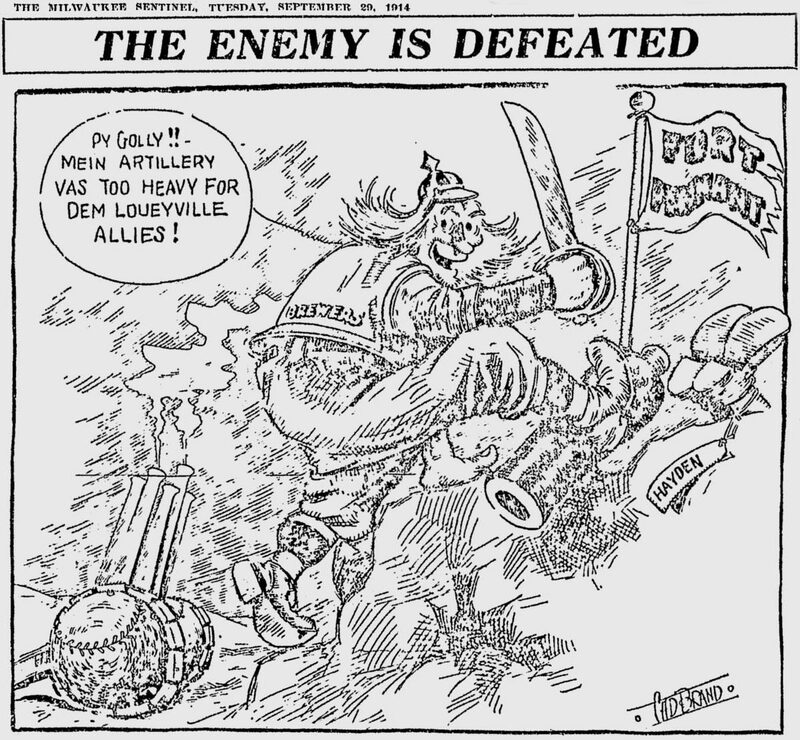 The cartoon was by Clarence "Cad" Brand, who had been scribbling for the Sentinel since 1900. Brand created this long-haired character, who was more commonly seen in a baseball uniform and old-fashioned cap, to represent the Brews. I'm intrigued by the imagery Brand has chosen for this victory cartoon. The World War was only two months old. The cartoon was published exactly three months after the murder of Archduke Franz Ferdinand of Austria on June 28th, and two months to the day after war was declared. 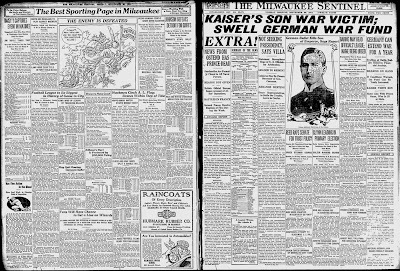 I imagine that, at the time, nobody fully appreciated that the conflict was eventually going to spread across the ocean, but even so the military imagery is curious given the war headlines racing across the facing pages of the paper. Of course, the war would not be contained to Europe, and less than three years later the United States declared war on Germany and began sending her boys "Over There". 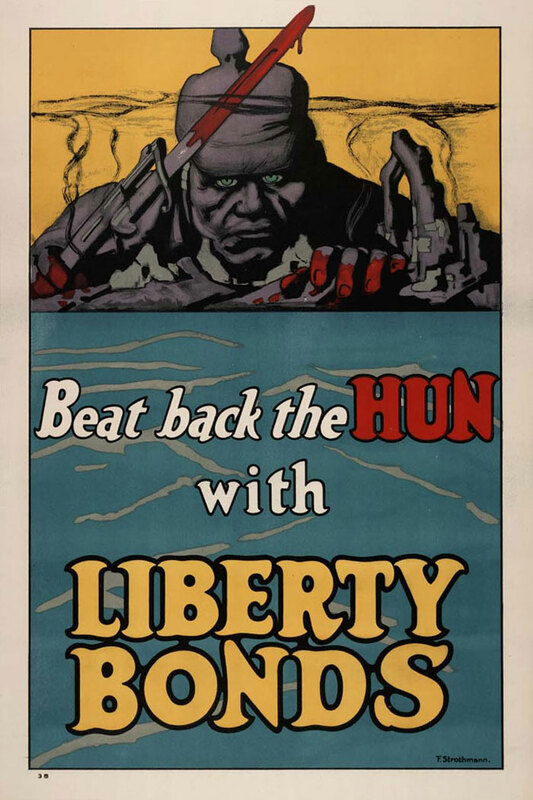 To drum up and maintain support for the war, the U.S. government launched an anti-German campaign, using imagery stunningly similar to Brand's. This poster by artist Fred Strothman depicts almost exactly the same scene as Brand's cartoon, but from the other side of the hill. Our lovable "Py Golly!" character is now the bloody Hun, saber, pickelhaube and all.